On a cold winter’s day, when the temperature on the thermometer dips to minus 17, there are only a few creature comforts that help warm you from the inside. Things like as a warm pair of socks, a hot meal, and good cup of coffee, can usually do the trick, to make you feel better, and help to cheer you up. For those who came to the DeMazenod Door, for Sunday’s lunch, they were treated to all those things and just a little bit more. It’s the fellowship and conversation that brings Margie and her husband to the lunch for the first time. “It was very nice to have a hot meal on a cold day,” says Margie. Both Margie and her husband Dan are on the Ontario government’s basic income pilot project. She admits that they are doing much better, now that they are on the program, but says they often get very lonely. “People who are lonely get to have some fellowship… It’s good to have someplace to go… It makes me feel needed and wanted,” adds Margie. Margie and her husband were two of the 273 guests that came to the turkey lunch at St Patrick’s School. Outreach Coordinator Sherri Ramirez says, for many local outreach organizations so much of their focus is spent on Christmas, but after the holidays, there aren’t many options for a hot meal. “Many of our guests struggle to make it through the month; even expressing how people will forget about them till Easter,” says Ramirez. Before the guests left, they were told to pick up a gift bag. All of the 350 donated gift bags, came from parishes across the city, and the Good Shepherd. The bags contained, warm mittens, socks, a hat and some chocolate. While the DeMazenod Door was open Christmas Day and New Year’s Day providing lunch, the work of feeding the poor and marginalised, isn’t a one day job. It continues 365 days a year at St Patrick’s. “Hunger does not take a holiday nor does kindness and love for our community,” says Ramirez. 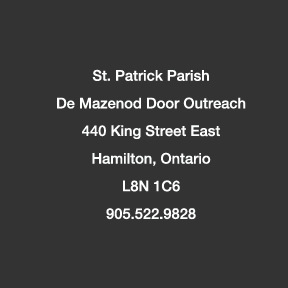 We have upcoming training sessions for anyone interested in becoming involved in our De Mazenod Door Outreach Ministry. This is a wonderful opportunity to make some new friends while helping our brothers and sisters in need. Send us an email or give us a call to find out when the next session is taking place.